It is quite common for Korean food companies to dispatch part-time or irregular workers to promote their sample foods at supermarket chains. However, at Ottogi, such salespersons are hired as full-time employees under the legacy of Ham Tae-ho, the late founder and honorary chairman of Ottogi, who passed away on Sept. 12 at that age of 86. Born in Wonsan in South Hamgyong Province, now in North Korea, Ham founded Poonglim Trading in 1969 which is now called Ottogi Corp. Poonglim was the first in the nation to manufacture instant packaged curry, tomato ketchup and mayonnaise. Ham was active in carrying out corporate social responsibility. At his own expense, he set up Ottogi Foundation in 1996 to offer scholarships to financially burdened university students. He also supported more than 4,200 children suffering from cardiac diseases for 24 years. Since last year up until his death, Ham donated a total of 3.93 percent of his Ottogi Corp. shares to non-Ottogi foundations. He donated 0.87 percent, worth 31.5 billion won ($27.4 million), from his own 17.46 percent of Ottogi shares to the Miral Welfare Foundation, an institute for the disabled, in November, 2015. Just three days before he passed away, Ham donated 3.06 percent of Ottogi shares to the Ottogi Foundation on Oct. 9. This raised the foundation‘s Ottogi shares to 7.99 percent now. Meanwhile, it is undecided who will inherit his 13.53 percent of shares in Ottogi affiliates. Ham had been holding an extra 10.93 percent in Ottogi Ramen and 3.01 percent in Choheung. Under the conventional Korean custom, Ham’s inheritance will be equally distributed to his three children. Ham’s only son Young-joon, the current Ottogi chairman, owns the largest amount of shares (15.38 percent), leading his family business. He is the 72nd richest businessman in the country with a bulk of assets worth 374.2 billion won as of Nov. 4, according to The Superich Team’s analysis. 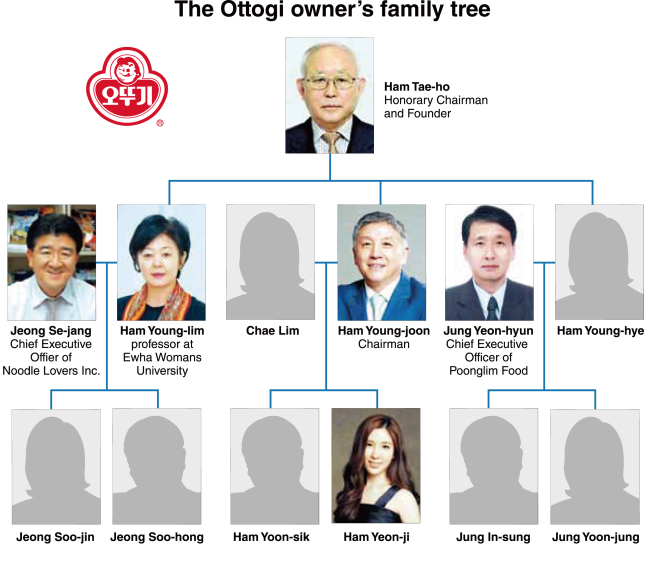 The junior Ham’s two sisters Young-lim, 59, and Young-hye, 55, are not engaged in the business but remain as the main Ottogi shareholders. Both own 3.31 percent in shares, respectively, worth about 84.6 billion won. The late Ham Tae-ho’s shares in Ottogi Corp. and other affiliates total 370 billion won. His shares in Ottogi and Choheung are estimated at 348.5 billion won. The shares in Ottogi Ramen is estimated at 29.2 billion won, at minimum. Korea imposes a 50 percent inheritance tax on inherited stocks worth more than 3 billion won. Under the law, the inheritance tax on Ottogi group is projected to exceed 180 billion won. Combined shares owned by 15 Ottogi family members accounts for 44.18 percent of all Ottogi companies. Ham Tae-ho’s younger brother Chang-ho owns 2.7 percent of Ottogi shares while another brother, Seung-ho, holds 0.98 percent. The shares are estimated at 69.3 billion won and 24.9 billion won, respectively. The late honorary chairman’s grandchildren also hold stocks in the business. The current head Young-joon’s son Yoon-sik, 25, holds 2.04 percent of shares while his daughter Yeon-ji, 24, has 1.16 percent in Ottogi. Young-joon’s wife Chae Lim owns 0.29 percent stake. Yoon-sik’s Ottogi shares are estimated at 52 billion won. Yeon-ji’s are worth 29.7 billion won. Chae’s are worth 7.4 billion won. Yeon-ji is a musical actress. After getting a diploma at Tisch School of the Arts in New York, she starred in “Gone with the Wind” last year. She modeled for an Ottogi commercial with the famous musical actor Lim Tae-kyung to promote an instant curry. Ham’s four other grandchildren each hold an estimated 7 billion won in shares. The senior Ham’s eldest daughter Young-lim’s children, Jeong Soo-jin and Jeong Soo-hong, own 0.29 percent and 0.26 percent of Ottogi shares, respectively. Young-lim’s husband Jeong Se-jang is the CEO of Myunsarang, or Noodle Lovers. Another daughter Young-hye has two children, Jung In-sung and Jung Yoon-jung, who own 0.29 percent, each. Young-hye’s husband Jung Yeon-hyun is the CEO of Poonglim Food. The Ottogi units under the Ham family’s ownership rake in profits through internal financial dealings. Out of 12 units based in Korea and seven units abroad, the only two Ottogi Corp. and Choheung are listed on the Kospi market. The rest unlisted companies have grown through internal trading. In particular, Ottogi Ramen and food processing unit Sangmi Food have been in close partnership in business dealings. Out of the 508 billion won of Ottogi Ramen’s total sales last year, 505 billion won came from trading with Ottogi Corp. Ham Tae-ho and Young-joon own 35.63 percent shares in Ottogi Ramen. Out of 85.7 billion won of Sangmi Food’s total sales last year, 83.9 billion won came from trading with Ottogi and Ottogi Ramen. Ham Chang-ho, Chairman of Sangmi Food, owns 46.4 percent in Ottogi Ramen. Ottogi Sesame Mills, Ottogi Logistics Service, and system integration affiliate RDS have been closely making internal trading deals with the two listed companies. Ham Young-joon owns a 26.52 percent stake in Ottogi Sesame Mills, a 16.97 percent in Ottogi Logistics Service, and a 60 percent stake in RDS. Another affiliate Poonglim Food’s insider trading ratio reaches 34.6 percent. Poonglim Food is currently under the leadership of Jung Yeon-hyun, second son-in-law of the late Chairman Ham. Jung holds the largest skate at 39.3 percent. Ham Young-joon is the second largest stakeholder with 28.6 percent. Young-lim owns 10.7 percent, Young-hye holds 7.1 percent and the CEO Jung’s eldest son In-sung has 2.8 percent in the Poonglim Food stake. Seafood processor Ottogi SF’s internal trading ratio with the Kospi listed companies reached 63.7 percent while an advertisement agency Ad Rich’s hit 21.6 percent.